J.L. Thompson has written several books on the subjects of ancient and modern mysteries, the origins of religion, mythologies, the occult, politics and history. He has long been interested in the literature of the ancient world. He has made a lifelong study of selected ancient texts and uses many of the accounts of these ancient records as the basis for this A Coming Flood series, including the political intrigues and sophistry of their day, which are eerily similar to those of modern times. The author sees many parallels between the ancient world and the modern, and in this series he draws out those parallels to illustrate that humanity follows similar paths regardless of the epoch. J.L. Thompson is an award winning author, a full time professional writer, ghostwriter and editor. 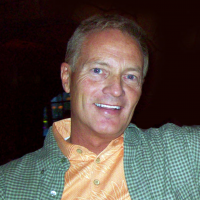 He is the founding writer and Editor-In-Chief of Scottsdale Multimedia, Inc., the nation’s leading ghostwriting firm. He personally writes one or two books annually, and supervises the writing and editing of around 30 books each year. He holds a Bachelor’s degree in Humanities and a Doctoral degree in Jurisprudence. He was Articles Editor of the BYU Law Review, and served as an editor of various legal and other publications.